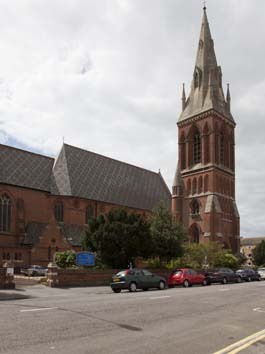 St Saviour is the only Victorian church in Eastbourne to stand comparison with the greatest ones in Brighton or Hove. It replaced an iron church opened in 1863 (1 p25), which was intended to reduce the overcrowded congregation of Holy Trinity. The architect of the permanent church was G E Street (B 23 p788) and it is his only complete church in Sussex. The foundation stone was laid in November 1865 and though the church was consecrated in 1867, the spire was not finished until 1872 (Brown). By 1875, £16000 had been spent (PP125). 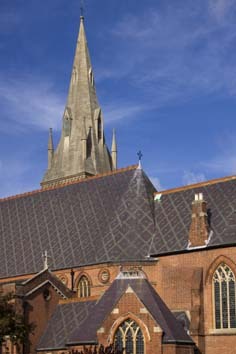 Red brick is used throughout and the roof retains its original patterned slates. 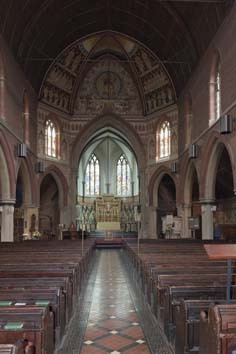 There are large, three-light traceried clerestory windows, separated by small roundels; the low, narrow aisles have paired lancets, thus reversing the usual proportions. The east end is also novel, as the nave is canted inwards with a proportionately small chancel, more a sanctuary, in the form of a vaulted four-sided apse. The easternmost point is thus an angle, not a flat wall. According to Street’s son, there was no compelling reason and this arrangement was ‘a matter of choice’ (A E Street p110). However, a report in Building News for 1871 (19 p41) states that the aim was to make the altar and choir easily visible from all parts. The exterior, dominated by the north west tower and spire, is typical of Street. The tower stands by the north aisle, with an ornate doorway in its vaulted base leading to an inner doorway, decorated with marble shafts, dogtooth and fleurons. The upper stages of the tower have blank arcading below tall two-light bell-openings, flanked by single blank arches. The broach spire of East Midlands pattern has lucarnes and pinnacles. The exaggeratedly long windows of the west front, contained in a single arch, emphasise the strong verticals, offset by the horizontal bands of light stone between the heads of the windows. One disadvantage of Street’s novel plan for the eastern parts was the inadequate space for clergy and choir in the chancel, which is vaulted. 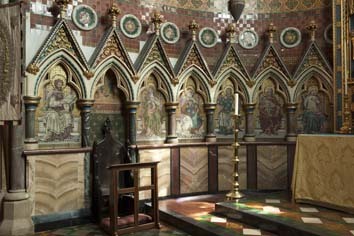 As early as 1871, before the tower was completed, he incorporated the area west of the chancel arch in the sanctuary. This was paved with Godwin’s tiles (B 25 p175) to match the chancel and surrounded by a low alabaster and black granite wall (B 29 p773). However, much of this has gone in one of the remodellings of the sanctuary area, the most recent of which was in 1993, as an inscription records. Street also introduced wall-arcading within the chancel proper, incorporating onyx and other exotic marble shafting. Though later alterations have not seriously compromised Street’s concept, some were not beneficial. A hexagonal vestry of 1888 by H Spurrell was intended to match the original (CDK 1888 pt 2 p140 as ‘R Spurrell’, which is clearly an error); he also added in 1896 the low west porches with a baptistery (WSRO Ep/II/27/127a). ‘Mr Murray’ (almost certainly W H Murray, who was Spurrell’s partner) designed a vaulted chapel (Brown) in 1903, separated from the south aisle by an arcade, filled with ironwork screens. The wider eastern part of this comprises a double arch, cusped on the chapel side, within which is the tomb of the first vicar, the Rev H R Whelpton (d1902), whose father paid for much of the church, in the form of a brass. 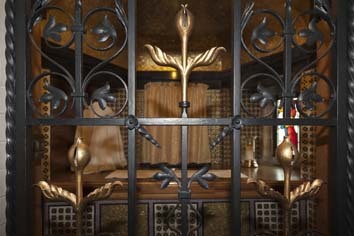 On the south side of the altar behind an iron gate is a recess used for the reserved sacrament. The chapel was the final addition to the church, which fared less well for the next 90 years. Street’s reredos was removed in 1928 (Faber Guide p38) and war damage obliterated most of the glass by Clayton and Bell and damaged the chancel and south chapel. In 1946 W H R Blacking remedied this, but painted out most of the mosaics and paintings throughout the church (see below). Most of these are now once more visible, to the great benefit of the interior, although Blacking’s pastel shades in the sanctuary and west organ gallery remain. Carving: (Altar of south chapel) Oak relief of the Burial of Christ, G Jack (Watney p44). Font: Though the bowl is not especially large, it is made of a piece of onyx and is said to have been designed by Street (Watney ibid). It was obviously relocated when the baptistery was added. 1. (South aisle and south east clerestory) Two lancets in the aisle and some larger figures of saints in the clerestory remain from the original glass by Clayton and Bell, otherwise destroyed. More of their work has been reset in the west windows of the south chapel. 2. 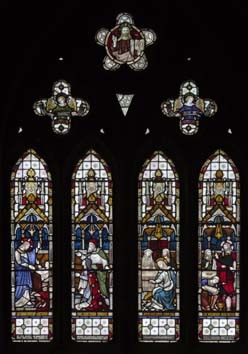 A window of 1884 by J Powell and Sons (designed by J W Brown) near the baptistery (CDK 1886 pt 2 p44)) was destroyed by the bombing, as was other glass by the company, one possibly designed by by F Mann. 3. (North east clerestory windows) Clayton and Bell, 1868. These figures of saints, presumably without their backgrounds, were removed here from Gloucester cathedral in 2006 after a re-ordering there, as a memorial to Ian Gow MP and Paul Crook (CT 22 Sept 2006). 4. (Apse) Four lights, C Webb, 1953 (www.stainedglassrecords.org retrieved on 11/2/2013). 5. (South chapel sacrament recess – small light) G L Whelpton, undated (ibid). 6. (South chapel, four south and four north windows) Shrigley and Hunt, c1903 (ibid). 7. (‘Two-light nave west window’) R de Montmorency, c1961 (DSGW 1961). In spite of this statement, no window of this description is to be seen in the church, where all west windows are of clear glass. Lectern: Double-sided brass and designed by Street in 1875 (BN 29 p656 as ‘St Saviour, Hastings’ – an obvious error). Mosaics and other decoration: Clayton and Bell and started before 1877 (CDK 1877 pt 2 p87). 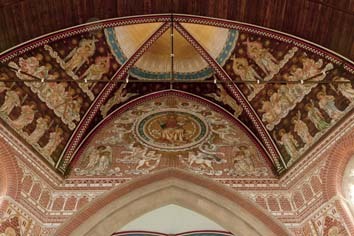 Until 1991, much was darkened or smothered in paint except for some single figures, but a painted Christ in Majesty, surrounded by saints and angels, has been revealed covering the whole area above the chancel arch. 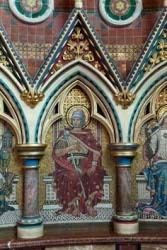 In the aisles are mosaic panels, some donated as late as 1907, but clearly conforming to the original scheme. Those in the chancel were the earliest and were made by Salviati of Venice. The chancel mosaics and painted figures are subordinated to the rich tiling and marble cladding, but the effect must be close to what was intended and is a remarkable feat of restoration. 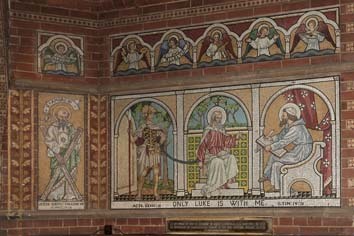 Further mosaics by J Powell and Sons (designed by J W Brown) were added in 1906 (in 1903 he had also designed a decorative scheme for the baptistery) (Hadley list). 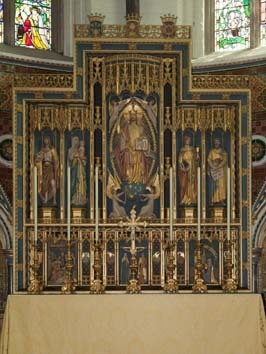 Reredos: Carved and painted, W H R Blacking, 1937 (Watney p43). Pulpit: Massive and round, made of stone with nailhead and foliage capitals. It looks to be designed by Street and was carved by T Earp. The steps up to it are recessed into the adjacent pier of the arcade. Statue: (North east corner of nave) Virgin and Child by L Grossé, 1928 (1 p18). War memorial: (Outside west end) C H Murray, 1920-21 (WWA 1923). 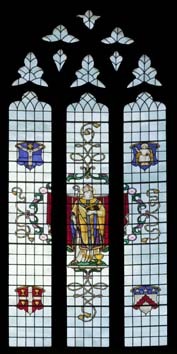 My thanks to Nick Wiseman for the photographs of St Saviour’s and for clarifying the position about the de Montmorency glass.